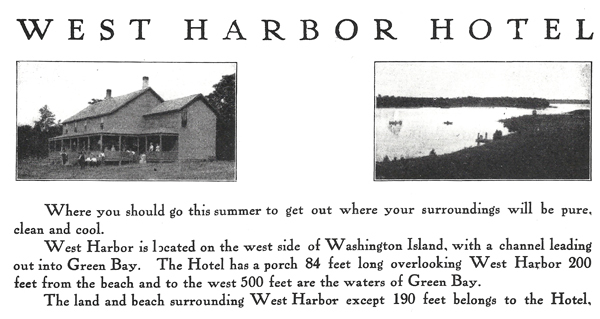 Not much has changed in the 100+ years since the above ad was published promoting West Harbor Hotel (now known as Gibson’s West Harbor Resort). And that’s the attraction, of course. At Gibson’s, you can take a step back in time for a few days, a week, or even two weeks, and at reasonable cost. The pace is slow, the water blue, the people friendly, and the excitement level manageable. Your cell phone may or may not work, but away from the pressures of your work life, you’ll definitely recharge, sleep better, and feel better. Herb and Marianna Gibson and their entire extended family welcome you!